A report in The Guardian says Activision is being sued by three children of Jonas Savimbi, an Angolan rebel chief who appeared in Call of Duty: Black Ops 2. 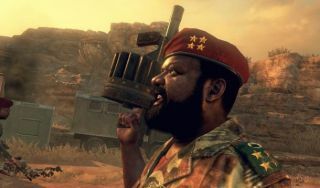 The trio are seeking €1 million from the French division of Activision Blizzard (they live in France) for the game's unflattering portrayal of Savimbi. To my eyes, the video linked in the article (and above) would seem to support Activision's position. Yes, Savimbi exhorts his troops to kill the MPLA, but that's basically his job—this isn't Call of Discussion Over Afternoon Tea. And he does appear to lead his forces effectively. Even the American troops in the video acknowledge his courage in the field. This is actually not the first time Activision has been sued over its presentation of a historical figure in Black Ops 2. Former Panamanian strongman Manuel Noriega did the same thing a couple of years ago, claiming the game portrayed him as “the culprit of numerous fictional heinous crimes.” (As opposed to his numerous real-life heinous crimes, I guess.) Fortunately for Activision, that case was ultimately tossed out after the judge ruled that the game is a transformative work. French laws obviously aren't identical to American, but I will be very surprised if this claim doesn't go the same way.